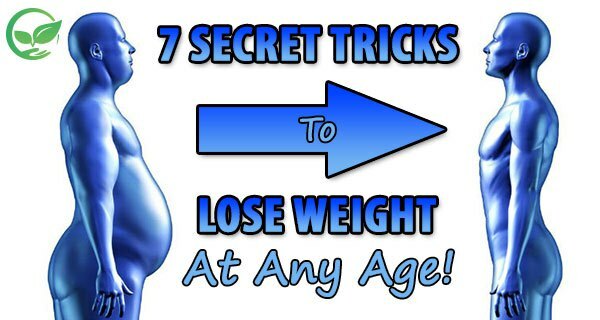 Home Unlabelled 7 SECRET TRICKS TO LOSE WEIGHT AT ANY AGE! When we get older, our weight loss plan becomes a little bit problematic. Our muscles become stiff, they make our exercising less convenient, and they hurt more. Our metabolism slows down too. Every decade on average, we burn 1 to 2% fewer calories. This is a bad cycle, and if we are not careful, as our age goes up it can easily get out of control. According to the personal trainer and NSCA-certified strength and conditioning specials, Brian Durbin, if we know the roadblocks we will know how to successfully drop pounds. As we get older it is more and more likely that our hormones could fall out of balance. If you do not regularly check your thyroid, adrenal glands, and other hormone levels, the fat can be easily stored in your body. A very important hormone is the testosterone that needs to be watched. A balanced level can keep your blood glucose in normal levels, which is crucial for losing belly fat. You should regularly check your hormone levels. People often complain that they cannot lose weight as they used to before, because of the muscle mass. The muscle mass is more active than the fat, which requires much more energy. This also means that if you lose muscle mass, the metabolism will slow down. The 50 years old people have 20% less muscle mass than they had in their 20. Durbin says that if you are having a good weight training routine, you will expand your muscle mass and will lose weight like you were losing 20 years ago. You must push yourself to achieve your goal. You should never be in pain while you exercise, but you should not go easy, too. You have to make sure you are working out hard enough, sweat, and complete the whole range of motion while you are exercising. You have to put the effort in and you will get desired results. Losing weight is not easy, so you have to be prepared for long exercises. It is a fact that your body will feel better, not worse, after you are done. Pains and aches become very common as you get older, and if you are not active, then the situation will become even worse. Recommended exercises are: walking, jumping in the pool, and water exercises like Aquafit. As we get older, our daily diet needs to be changed. We need more nutrients and fewer calories. So, we need to forget about consuming empty calories, and we should concentrate on nutrient-rich foods like vegetables, fruits and lean proteins. Consulting a physical therapist is recommended for people who are suffering from some kind of pain. This is recommended before starting any new exercise. The therapists will give you a lot of good advice about the most effective exercises. They will also give you instructions on how to do the exercises that will help you to relief pain. Our life becomes more stressful as we grow older. Durbin said that the average 50 –year- old has many more responsibilities than any younger one. They are having a lot responsibilities at work, probably their kids are going to college or they are caring about their old parents. You can feel hungry and you can avoid the gym because of the stress. In order to bust this cycle, you should schedule time for exercising. The best way to relieve the stress is a good, consistent exercise regime.